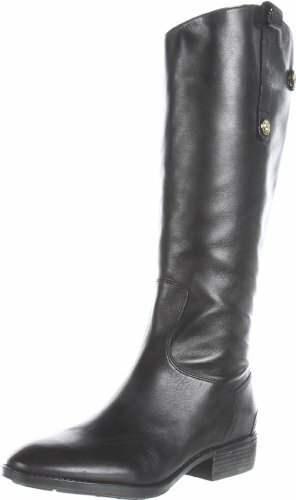 When it comes time to purchase new leather knee high boots, you will be blown away by the selection on offer. Not only can you now choose from black leather boots that go above your knee, but a range of colors, sizes, and styles as well. You can select from genuine or faux leather, suede, and with ruched styling too. What’s more, you can opt for rugged and thick rubber soles or sleek and tall heels. 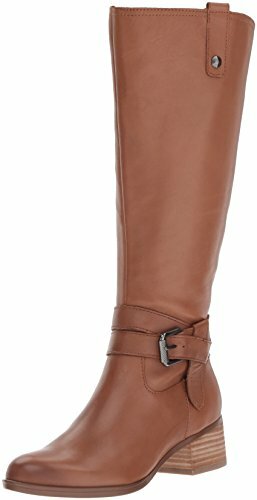 There is no one size fits all approach to finding the perfect leather knee high boots because they all differ so significantly. If it’s not the style that’s different, then it’s the size, shape, or color. 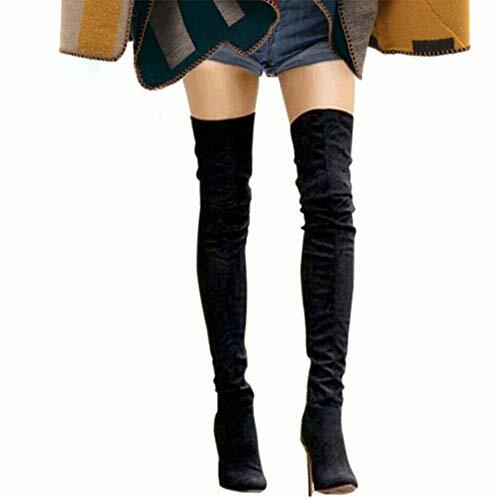 If you are looking for the best pair of leather knee high boots money can buy, then you are sure to find there are a few potential options in these nine pairs below. Whether you’re going out for a night on the town, or you want to dress up, you will need this pair of leather knee-high boots from Mostrin. While they may be a little challenging to get used to, the price tag coupled with the many standout features will ensure they are a pair of boots you end up wanting to own. 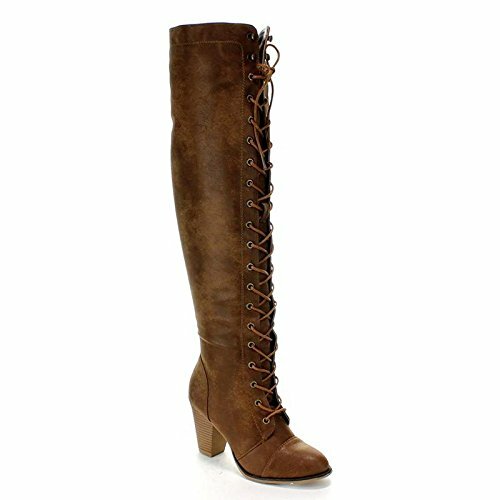 When it comes to selecting these leather knee-high boots, you will be pleased to know they will most likely have your size. You can choose from 15 size options, all the while opting for either white, black, or brown boots to match your outfit. All of the boots have synthetic soles, feature PU leather, and have a high platform heel. The platform is 1.57 inches, while the height of the heel is 5.31 inches. If that wasn’t enough to convince you that this pair of leather knee-high boots will give you ultimate flair, then the sleek pointed toe and over-knee style will. These boots will be unlike anything else in your wardrobe, so if you’re looking to make a change, now’s the time. Whether you’re a dancer or you’re gearing up for a themed night out, you will find these leather knee-high boots meet the mark in so many ways. Even though they do run on the expensive side, there’s a reason for it: they are unique and hard to get. If you are a professional dancer, there’s every reason to consider purchasing Ellie Shoes women’s Fantasy Boots and reap the rewards. The first standout feature is the color scheme. Unlike other leather knee-high boots on the market that are mostly brown and white, these offer a new transparent option. Therefore, you can either select from everyday black and black, or black with a transparent shoe section. If that isn’t enough to set you apart from others, then nothing will. They are a synthetic pair of leather knee-high boots, come in seven size options, and have a leather sole. Therefore, they are more comfortable to wear than they look. The heel is also 5.25 inches high, while the platform is 2.75 inches. Before long, you will look like a master when you hit the pole wearing these. They are also stretchy, available in whole sizes, and are every bit the description of “fantasy” boots. If you are still undecided about what leather knee-high boots to buy, don’t look past this pair. 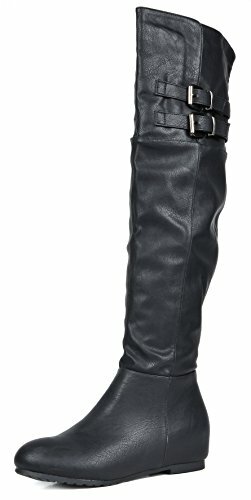 For any occasion, any woman needs a nice pair of leather knee high boots to help them stand out from the crowd. Fortunately, Termarnoov delivers with this high-heel platform set in black. With PU leather, rubber soles, and 12 sizes from which to choose, you are bound to be impressed by everything this over-the-knee pair of boots has to offer. The platform is 1.75 inches to be more comfortable to wear, while the soft insoles mean that wearer fatigue is not a problem. However, the benefits don’t end there. With stretchy fabric and long zips, you will always feel comfortable when you’re wearing these boots. They do up snugly around your leg, fit well around the knee, and sit beautifully around your leg. What’s more, they are suitable for large and small feet and legs that are a little wider than average. Even though you do pay more for these leather knee-high boots, it’s clear to see why. They are high-quality, durable, and will get heads turning when you wear them. 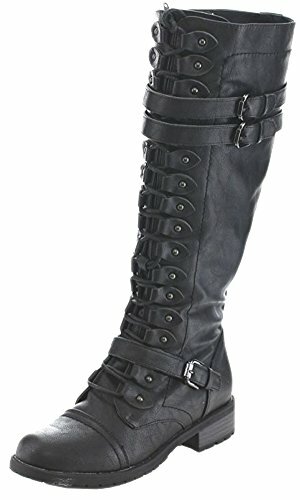 If you have relatively thin legs or at least thin thighs, then you will find that these leather knee-high boots will be one of the best shoe purchases you ever make. Even though you aren’t going to wear them every day, they will meet the mark for both formal and casual occasions when you want to get heads turning. When you go to buy them, you can choose from nine size options and two color options of black and white. Therefore, you are bound to find a size and style to suit your requirements. The next standout feature is the heel. Unlike other leather knee-high boots on the market, the heel is a bit thicker and at least half an inch shorter. While it still looks tall and striking, it offers far more confidence and balance when you walk in them. Finally, the faux leather is soft and supple against your skin, while also fitting more size and shaped feet than other leather knee-high boots for sale. If you’re ready to swap the sandals for something more stylish, set your sights on these boots from IDIFU. If the price is not a factor when you’re looking to buy new leather knee-high boots, then take a closer look at this pair from VOCOSI. Even though they are a little on the high side price-wise, they are worth every penny for everything they have to offer. The price factor is undoubtedly down to the premium materials in use. The majority of these leather knee-high boots feature premium real leather, while a small portion of the shaft is synthetic. On the inside, you also benefit from a faux fur lining which helps to keep your feet warm in those colder months. They have a rubber sole, a 3.54-inch heel, a 14-inch boot opening, and consist of an over-the-knee style. What’s more, when it comes time to purchase these leather knee-high boots, you can select from black or brown with or without a buckle. While you will find these boots are very narrow – both in the leg and foot, they are an exceptionally well-made product. Therefore, if you see a pair that fits you well, you will be more than impressed by their longevity. If you have wide feet and calves and you’re in the market for a pair of leather knee-high boots, you usually come up empty-handed. 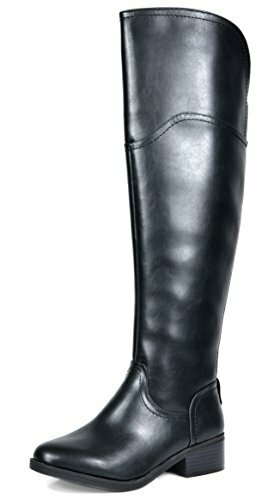 The majority of leather knee-high boots on the market are suitable for people with narrow feet and thin legs as opposed to women with larger feet and legs. However, thanks to Premier Standard, all women now have a choice. If you happen to have wider feet and thicker legs, you will find these boots are more than capable of catering to your requirements. They offer plenty of stretch and customization in the leg, as well as being exceptionally comfortable to wear. While they could do with more padding, it’s a small price to pay. These boots are also available in taupe, wine, and black, nine sizes, and with a heel size of four inches. As a result, you will have more confidence to walk around in these all night than you would with anything higher. They also have a generous boot opening of 17 inches, feature a grippy rubber sole, and 100 percent faux leather. As a result, you don’t have to worry about animal cruelty. For many people, these leather knee-high boots will tick all the boxes. It’s well worth considering adding them to your wishlist today. Buying leather knee-high boots can be quite an expensive exercise, with some shoes running into the hundreds of dollars. If you are on a budget yet still want to benefit from the classy footwear known as leather knee-high boots, then set your sights on this pair from DailyShoes. With an exceptionally affordable price tag and 30 colors from which to choose, you are spoiled for choice. You can buy three pairs for the price of one in some other brands. Alongside the affordability, the features of these leather knee-high boots will meet the mark for many people too. They feature comfortable rubber soles, a short heel for those who struggle with high heels, and sleek faux leather suede as well. What’s more, you will be more comfortable wearing them knowing the slouch design and round toe makes them more suitable for thicker legs and broader feet. Even though there are only four sizes from which to choose, you will be pleased to know that the variety on offer is changing all the time. Consider these leather knee-high boots when you’re in the market for affordable footwear. If you want to own leather knee-high boots as well as ankle boots, then you have to buy two pairs of footwear, correct? When it comes to these boots from Mostrin, however, that couldn’t be further than the truth. Known as “two in one” shoes, you benefit from leather knee-high boots that can immediately transform into ankle boots. Remove the leg component, and you can change your style. This feature is unique, but it’s not the only thing this pair of shoes has going for it. You can choose from 17 sizes, two colors of either apricot or black, and benefit from the knowledge that thanks to their rugged and rubber sole, they will last for a long time. What’s more, they have PU leather, slip-resistant heels, and a more manageable heel dimension than what some other boots offer. While the sizing is not accurate in comparison to other boots, it just takes a measuring tape and forethought to be happy with your purchase. Consider adding these leather knee-high boots to your shopping cart today. If you want a pair of leather knee-high boots that won’t break the bank or fall apart as soon as you wear them, take a look at these. Even though they are some of the most affordable boots on the market, that doesn’t make them any less deserving of your purchase. You can buy them in nine sizes and three colors while benefiting from unparalleled comfort and design. They offer a fuller calf style than other boots, as well as rounded toes, which means that people with wider feet will find them very comfortable. They also feature faux suede leather, are correct sizes and have intricate stitching detailing you would expect in shoes of a higher price bracket. Even the soles of these shoes are impressive. They are rubber, rugged, and non-slip, meaning they are going to give you more confidence to wear them more often. When it comes to affordable leather knee-high boots, these will surprise you. Buying footwear online can be tricky, as you never know what the manufacturer has in store. Do they aim to deceive? Is their sizing correct? Are the material and color as good as it looks in the picture? You can never honestly know what you’re going to get until it arrives in the post. However, you can dramatically reduce the risk of needing to post a one-star review if you do your due diligence. Take note of these points below and buy a pair of leather knee-high boots with which you will be happy. One of the main reasons why people leave one-star reviews on the likes of Amazon is because the shoes they purchased didn’t fit. Sometimes, that’s down to incorrect measurements provided by the manufacturer, and other times, it’s a result of the buyer not doing their due diligence. If you want to make sure the shoes fit you when they arrive, measure your feet them compare them to each provided measurement. Often, suppliers will offer leg opening, shaft, heel, and shoe sizes. If you are unsure, contact them directly. The material is not often crucial to everyone, but to some people, it matters the most out of all features. Some people like only genuine leather footwear, whereas others prefer faux. Then, there are the consumers who want just suede shoes. If you are unsure what the leather looks like in the pictures, refer to the description. Don’t assume it’s leather, faux, or suede. It may not be. Whether you’re comfortable with heels or not, the heel can be a deal maker or breaker. Often, when looking for a new pair of leather knee-high boots, the heel is quite high. If you don’t think you can walk in it, then get out a measuring tape and draw it out to the length of the heel size described by the manufacturer. Put it up to a pair of your shoes and compare the difference. Doing so can save a lot of hassle if you end up buying shoes you’re not comfortable to wear. The problem with many leather knee-high boots is that they are not always suitable for people with wider legs and feet. Often, the leather material runs up the leg and over the knee with a zip, sealing in the leg as tightly as possible. They then run down to the foot, narrowing in at the toe. Unfortunately, for people with wide calves and feet, it can be a challenge to find leather knee-high boots that factor this in. Always read the reviews to see if other people in your predicament found a solution with a specific brand.